The first year students of Heritage Management had conducted a one -week field immersion programme in Muziris and Kutch as part of the course curriculum. Muziris was once upon a time a port that was centre of the world’s attention. And then one day, Muziris disappeared. Over the years, the world searched high and low for the almost mythical port and the best guesses for the location of Muziris is centred on the mouth of the Periyar River. Cutch, also spelt Kutch or Kachchh, was a relatively large Indian princely state during the British Raj. Its territories covered the present day Kutch region of Gujarat north of the Gulf of Kutch. Bordered by Sindh in the north, Cutch State was one of the few princely states with a coastline. The living culture is the most important facet which has been still intact over the years. 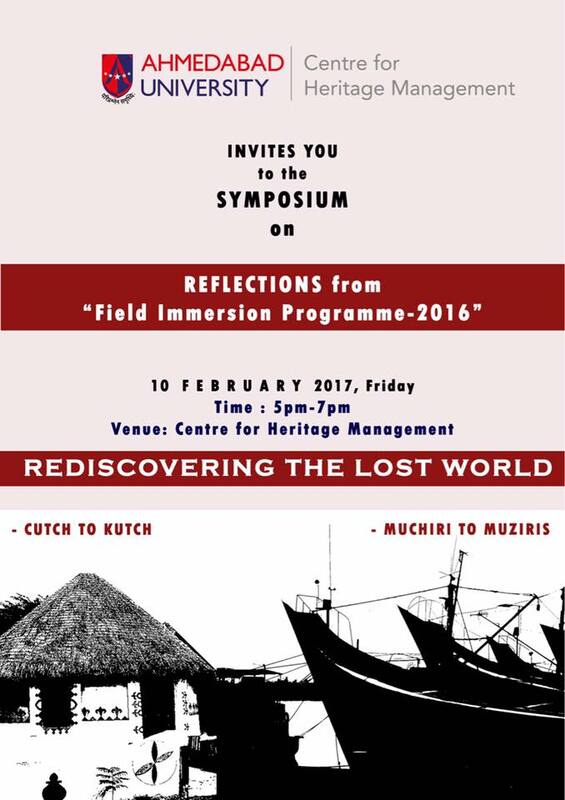 Therefore we are conducting a SYMPOSIUM presenting our reflections on our field immersions on 10th February 2017 at Centre for Heritage Management.